Can I just point a few things out before reviewing the picture? Look at the new image! We thought this better reflected the new Darth Maul packaging. Look for a new logo for Movie Heroes as well. Now, Anakin Skywalker. Did we really need another? Read on! Good to be back! Ah, it felt so weird not writing reviews. Sometimes I just wonder what Hasbro is doing, and the 2012 Clone Wars launch just makes me wonder even more. Not only do they not send too many figures out, but they only launch a line with three new figures. Three. New. Figures. And, it’s an Anakin, a Cody and a Clone Trooper. Sure, Anakin is in his Season 4 outfit and the two clones are Phase II, but seriously, is that the way that they need to launch this line? I submit that it was not. Anyway, let’s look at this Anakin. Let’s start with his sculpt: it’s not bad. Have you ever had one of those figures which you liked better, but couldn’t tell why? In my mind, this figure is better than the Shadows of the Dark Side Anakin in Season 3 outfit, but in ways that you wouldn’t expect. 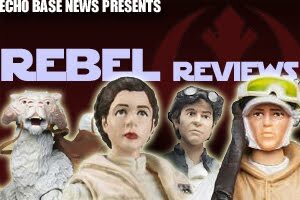 I can almost say that the comparison is close to comparing the super articulated clone trooper to the Stone mold: the S3 Anakin mold seemed so stiff. All plastic, and you didn’t even want to bend the knees because he didn’t have ankles anyway. (Seriously, if you pose him differently, post a picture on our Facebook page.) This one seems more limber. I can’t describe why without both figures in front of me, but this figure just has a more natural stance. And you can bend his knees and instead of hard plastic, this one has soft goods. Yay! There’s a step up, huh? Another thing that I really appreciate is that both of his hands have been sculpted with the ability to hold a lightsaber. The Force push hand is cool, but seriously, if that’s our only option I won’t be happy. As if the old one wasn’t limited enough in display options, am I right? His articulation remains close to the same: ball-joint shoulders, elbows, knees; swivel waist, forearms, hips. His head joint is different, though…it’s comparable to the clone trooper’s original articulated wrists. Seriously, it will not go in every direction that you would think it can – you’ll break it or something. Why would Hasbro do this? For Marvel Legend collectors, it’s the same type of neck articulation that female figures received, and that’s no good. It helps him make looking up poses, but you’ll see the obviously different color neck pin. RAWR. That’s the biggest pet peeve of mine. Loose ends: His head sculpt is great. It looks a little like Dolph Lundgren at first, but it grew on me. 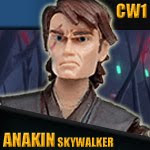 It’s a lot better than the horse-face that the original S3 Anakin was sporting. (Too bad they couldn’t fix the problem between the head and neck matching!) The launching thing is just dumb. Does it work? Sure. Do you care? Doubtful. But don’t worry, I’m sure some kid somewhere would appreciate it, I guess. Note: The stands are now more tan/beige, depending on whether you ask me or someone who knows more than eight colors. It is not the silver of the Shadows of the Dark Side packaging. Which is super disappointing. Bottom line? Wait for the Deluxe pack, get a somewhat cool vehicle and the Anakin should be similar enough, or better.